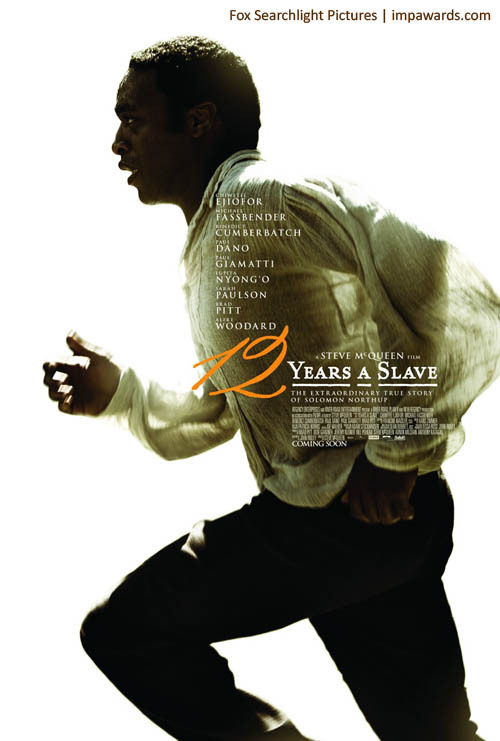 12 Years a Slave is based on the true story of Solomon Northup, a free African American who was kidnapped and sold into slavery in 1841. The film is hard to watch at times, and shines a harsh light on one of the darkest moments in U.S. history, but it’s beautifully made and Chiwetel Eijofor’s performance was excellent. I really loved this movie. I don’t think it’s one I could watch multiple times, but I really loved everything about this film. I especially loved the cinematography. Maybe I was just paying more attention because of a Film & Media class I am currently taking, but I felt like they used a variety of really great angles and really got the most out each and every shot; there wasn’t a single wasted frame. One example – and probably one of the best sequences in the film – was a scene in which Solomon is nearly hung, but rescued by the overseer. However, the Overseer does not cut Solomon down, merely makes sure his feet are touching the ground so he will live then leaves to find the plantation owner. What followers was a terrific long shot – in both focus and time – in which Solomon struggles to keep his footing so he can keep breathing, while the rest of the slaves slowly come out of their homes and go back to work, no one willing to risk punishment by helping him. I just felt like this entire scene was such an excellent statement. The performances of everyone in the film were excellent. I still haven’t seen Dallas Buyers Club, but Eijofor is my favorite for the Best Actor category – and not just because I’m a loyal Browncoat (my first time seeing Eijofor was in Joss Whedon’s Serenity). His performance was excellent and I would love to see him win. I also believe that this film is the most deserving of the Best Picture Oscar, of the films I’ve seen so far (and unless they really impress me that’s not likely to change). Michael Fassbender also plays his role as the ruthless slave owner quite well. I haven’t seen much of Fassbender’s acting (all I can think of at the moment is X-Men: First Class) but he has impressed me with what I have seen. I’m not sure I would pick him to win the Oscar though, I still think Barkhad Abdi deserves that one. Lupita Nyong’o was also impressive as slave girl Patsy who is often used and abused by Fassbender’s Master Epps. And I can’t write a blog about this movie without mentioning Benedict Cumberbatch. The British actor once again employs an American southern accent (though this one was much better than his August: Osage County accent) to play the sympathetic slave owner Ford who initially buys Solomon, ignorant to the circumstances of his enslavement. Ford represents the slave owners who didn’t necessarily agree with slavery, but felt it a necessary evil to keep the Southern economy going. So don’t worry Benedict fangirls, his character isn’t nearly as despicable as Fassbender’s and as usually he plays the role brilliantly. Favorite Moment: As I stated above, I think my moment was that shot of Solomon after nearly being hung. I just think the way it was shot, and how long they held it, was wonderfully done.